Other Products by Muscletech. Search other Protein Powder products. 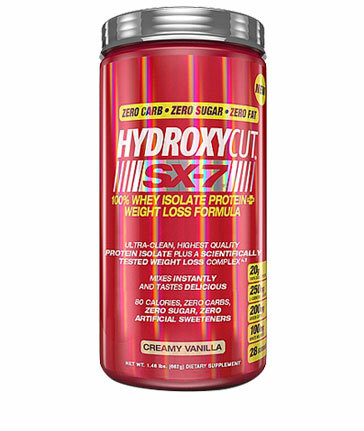 Hydroxycut SX-7 100% Isolate Protein Weight Loss Formula provides 20g ultra-clean, pure whey protein isolate per serve. Utilising an advanced microfiltration process to remove all fat, sugars and carbohydrates, Hydroxycut SX-7 Whey Protein Isolate is exactly that 97% Whey Protein Isolate – 0g carbs, 0g fat and 0g sugar. MuscleTech Hydroxycut SX-7 100% Isolate Protein Weight Loss formula also combines researched and clinically proven ingredients to provide a fat loss formula that works. Hydroxycut SX-7 Isolate Protein Weight Loss delivers 200mg green coffee, standardised to 45% chlorogenic acids, which showed a weight loss of 10.95lbs in 60 days. Hydroxycut SX-7 100% Whey Protein Isolate also provides the fat transporter L-Carnitine well known for its ability to assist fat loss by shuttling fatty acids into the cell to be used as energy for working muscles. The addition of white mulberry allows sugar to be excreted instead of absorbed into the bloodstream assisting weight management. Blend 1 scoop (24g) of Hydroxycut SX-7 Isolate Protein with 175 – 240ml of cold water, juice low fat milk, along with your favourite fruits for a delicious smoothie. Consume 30 – 60 minutes before your two largest meals. For optimum results use Hydroxycut SX-7 Weight Loss Protein in conjunction with diet and exercise for 60 days.